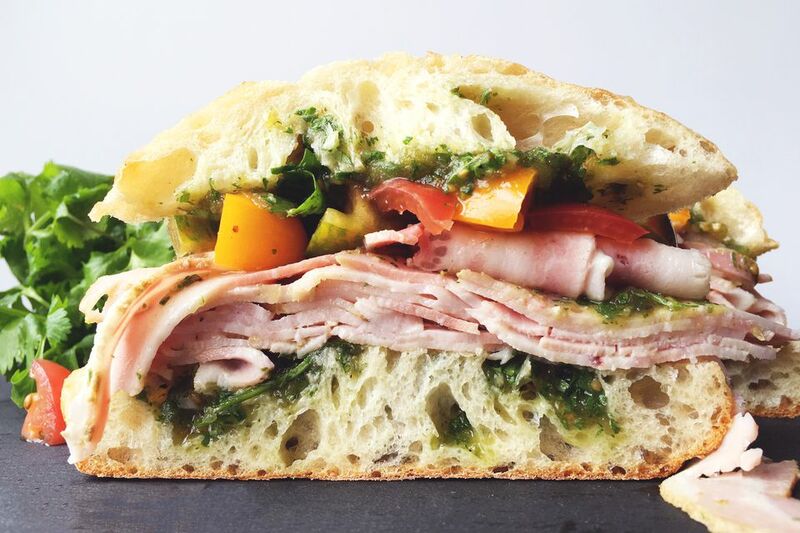 Aromatic shaved porchetta, tart salsa verde, sweet cherry tomatoes and crunchy airy bread make this popular sandwich super flavorful and delicious. n a small bowl, whisk together, olive oil, ground fennel, rosemary, garlic, red pepper flakes, pepper and salt. Arrange pork on a flat surface, skin side down, and brush on 3/4 of the olive oil mixture into the pork. Roll the meat up and tie it with the pre-soaked twice, every 2 inches. Brush the remaining mixture on the outside of the pork roll and bake for an hour and a half or until the center reads 160 degrees. Leave the porchetta in the oven and turn the broiler on and cook for 15 minutes or until the internal temperature reads 165 degrees. Remove from the oven and let rest. Shave with serrated knife before serving. Bring water to a boil and add tomatillos, onion, and garlic and jalapeno. Cook until tomatillos soften and remove pieces from the water - reserving the cooking liquid. Add ingredients to a blender with half cup of the cooking liquid and the cilantro and blend until smooth. Salt to taste. Toast ciabatta bun and add the salsa verde to each side. Pile on the pork and then top with cherry tomatoes. Serve immediately or tightly wrap in butcher paper and refrigerate.